As July advances, more and more of us make a bee-line for the beach to enjoy a day beside the seaside, but there’s more to the coast than just sandcastles and ice-cream cones (obviously important as they are). The sea is endlessly fascinating – especially now it has calmed down enough to stop taking huge chunks out of the shoreline, as was the case for most of the winter – but there are interesting details to note when you turn around and appreciate the hinterland, because for most of our islands’ 6000 miles of coastline, you’ll be looking at a cliff. The cliffs around our shores tell us a lot about the processes that have shaped our islands and even a cursory study of the various forms they take can be fascinating. Cliffs are usually the products of gradual erosion but sometimes can also be the scene of extraordinary rock falls and landslides and nowhere are there better examples of this mix than the south coast of England. 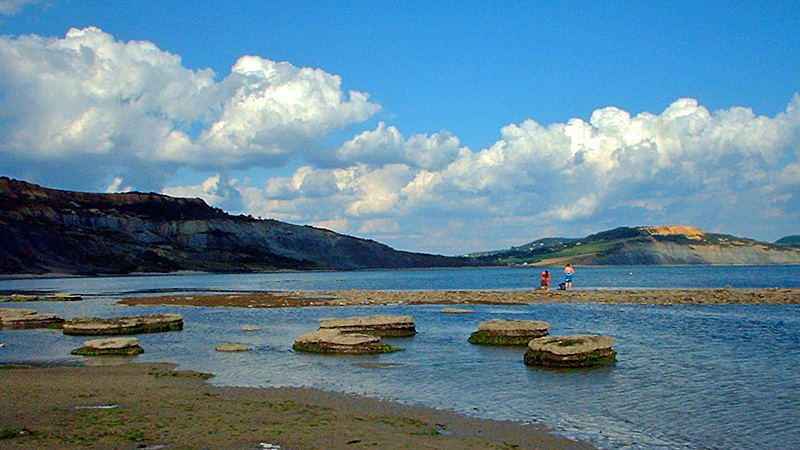 The highest cliffs on the English Channel are those of Hardown Hill, near Charmouth or, to use its more celebrated name, Golden Cap, which stands at 191 metres – around 637 feet above the beach. At the mid point of the Jurassic Coast, the area’s geology makes landslips and rock falls common, especially after wet weather. Landslips occur when a porous layer of rock – sandstone, chalk or limestone – overlie an impermeable layer, usually of clay. The water percolates through the porous rock and then lubricates the top of the clay until the rock on top slides away. There’s a spectacular example of a landslip between Lyme Regis and Seaton, halfway up the cliff. A five mile-long coast path that hugged the ‘undercliff’ here formerly ran all the way through this NNR, an amazing landscape known locally as the Elephants’ Graveyard, but it’s now closed near Culverhole Point because of further slips. A there-and-back expedition’s still possible as of writing, but see southwestcoastpath.com for the latest news. Rock falls are the product of more gradual processes than landslips and part of the evolution of the coastline which forms caves, arches, stacks and stumps in the piecemeal retreat of the cliff-line. Caves form when wave action erodes away a weakness in a cliff and when caves are on a headland – like those along the coast around Lulworth Cove – the erosion can work all the way through to make an arch, like the famous formation at Durdle Door or the Green Bridge of Wales on the Pembrokeshire coast. When the arch roof collapses, a stack remains and when the stack is undercut it leaves a stump, forevermore covered at high tide.